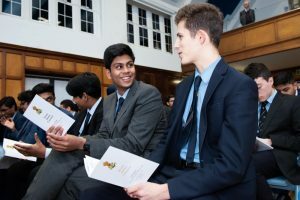 More than 130 prizes were awarded to boys in the top four years of the School at the 2019 Senior Awards Ceremony – one of the highlights of QE’s academic year. 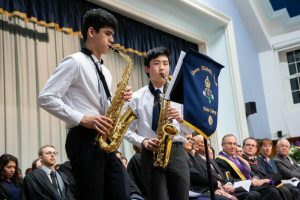 Parents, prize-winners, VIP guests, governors and staff assembled in the School Hall for an evening in which the achievements and endeavours of boys were publicly celebrated in a formal ceremony punctuated by musical interludes performed by the School’s musicians. The Guest of Honour was Professor Michael Arthur, President and Provost of University College London. Since he took up his post in September 2013, nearly one hundred Old Elizabethans have taken up undergraduate courses at UCL. 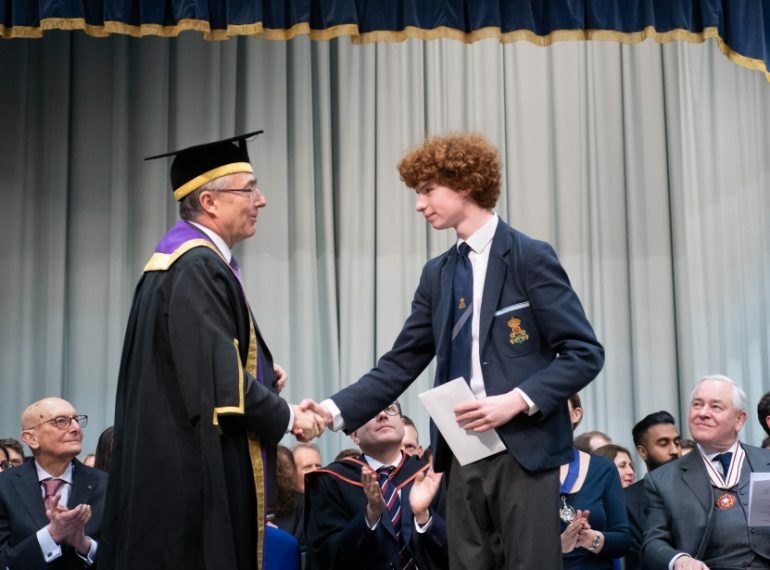 Professor Arthur awarded prizes to boys in Years 10 to 13, which ranged from awards spanning the curriculum from Art & Design to Technology, to Sixth Form prizes for commitment and service. 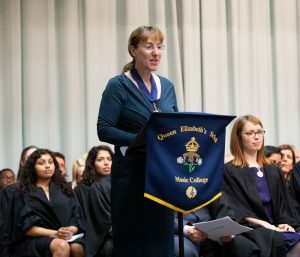 The extensive list of endowed prizes and special awards which were also presented reflects significant individuals and events in the School’s history. It includes, for example, two prizes named after former Headmaster E H Jenkins, the Bishop Broughton Prize for Divinity (the bishop, after whom one of QE’s Houses is also named, was a pupil in the late 18th century), and the Old Elizabethan War Memorial Prize. He encouraged boys to apply to the best universities – particularly UCL, of course – where they would be taught to think critically, to understand what knowledge is and where it comes from. There they would benefit from the collaboration between research and education, he said, affirming his strong belief in the desirability of a close connection between research and teaching. Professor Arthur, who is a hepatologist, shared much of his own story, from being someone at school whose prize was for being ‘most improved’, to making his first medical discovery, related to diabetes. It was not necessarily his best research paper, he said, but one of the most cherished, giving him a “a very special feeling, realising that for a short time I was the only person in the world to know that thing”. He encouraged the boys to “aim high” and “think big”, whilst also stressing the value of retaining humility. 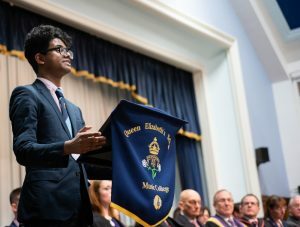 Citing former UN Secretary General, the late Kofi Annan, he spoke about the importance of making a contribution to society and the world, and helping those less fortunate – a theme also reflected in the vote of thanks delivered by the School Captain, Bhiramah Rammanohar. 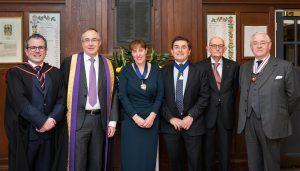 Other notable guests at the ceremony included: the Deputy Mayor of Barnet, Cllr Caroline Stock (who, as well as congratulating the boys, expressed the pride that the borough has for the School and its achievements); her husband, Dr Richard Stock, who is an Old Elizabethan himself (OE 1967-75), and Martin Russell, the borough’s Representative Deputy Lieutenant. 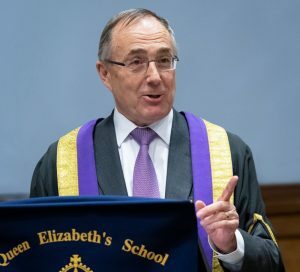 In his speech, after welcoming all the guests, Headmaster Neil Enright thanked the Foundation Trustees for their sponsorship of the awards and the Friends of Queen Elizabeth’s for their support both at Senior Awards and on many other occasions throughout the School calendar. Reflecting on the fact that this year marks the quincentenary of the death of Leonardo da Vinci – “perhaps human history’s most celebrated and archetypal polymath” – he highlighted the “unquenchable curiosity” and “feverishly inventive imagination” that da Vinci was reported to have had. “That is why we are so intent on encouraging free-thinking scholarship, critical questioning, and equipping you with the skills for life-long learning. Creativity cannot be scheduled, nor inventiveness timetabled,” Mr Enright told the assembled boys. “Follow what you have a passion for; pick the subjects you most enjoy; embrace trying to learn new skills at School and outside it. “These topics and interests can be eclectic. History shows us that many discoveries and inventions have come from the cross-pollination of ideas and experiences. “This is, though, no argument against expertise, or eventual specialism. Indeed, I am sure that this wi ll be the outcome for many of you. Music performed during the ceremony covered a number of genres, from Shostakovich’s Sonata in D minor Op. 40 for Cello and Piano, Movement 2, to two pieces composed by American saxophonist Gordon Goodwin.